Back with a brand new album, a huge Metal monster called 'Built To Last', Sweden's HammerFall are taking no prisoners. Full of powerful guitar riffs, commanding vocals and great songs, the band show just why they are so highly regarded in the Power Metal world. The band's founder member and guitarist, Oscar Dronjak, talks with Fireworks about the new CD. 'Built To Last' has a real retro feel to it, sounding a lot like your first two albums, 'Glory To The Brave' and 'Legacy Of Kings', but it still has that more up to date sound and production you're now known for. How do you see the new album? I can see what you mean. What happened this time was that probably for the first time ever the writing process was a difficult one for us. What usually happens is that we come off tour and we have about six to eight months to get everything written and arranged, then we go into the studio to record the new album. This time what happened was we never stopped touring; there was always some date or show to do, so we never got those months off to relax and settle in to our natural way of working. As the recording date got closer and closer I realised that I needed to really get going with the writing. Usually I love to write when I'm at home in a relaxed atmosphere but this time everything was hectic. So my rhythm was off and I didn't get a feel for how the songs would sound until we got into the studio and started recording them. That's when I noticed, like yourself, that they had a kind of mix of early and new Hammerfall going on, yet they did retain our modern way of working. You are now regarded as one of the eldsters of this genre. Do you still have the same passion and hunger that you did when HammerFall first got together? Yes and no I think. When we got together all we wanted to do was play and write Metal music, that was it. This was never supposed to be a career; we did it because we loved what we were doing. When we started playing Metal it wasn't doing well and who knew if it was going to last a week a month a year? No one! The hunger thing is also different – you're young and hungry when you start out but over the years you grow as a person, your values change. Other things like wives and families become your main concern. Of course you still love what you're doing musically but other priorities take over so the hunger might be different but the musical passion is still and always will be there. The problem for bands is we get accused of lacking the hunger by fans who forget that we, just like them, change as people over time. Yet you'll still get people coming up to you at shows saying you don't sound like you did back in '97. My answer is always why should we? We aren't the same people as we were back then, so why should our music sound the same as it did? Napalm Records, your new label, have really gone to town on the new album. Why the change from Nuclear Blast? Well we were with Nuclear Blast for almost eighteen years and they were and are a fantastic label to work for. They did everything they ever promised and were a joy to work with. When it came time for us to do this album we felt like a change and Napalm, although a smaller label, were so passionate about our music and what they could do with it, that we had to go with them. We think we can grow as a band on Napalm – if you can, take a look at the box set of 'Built To Last' which comes with a small statue of our mascot, Hector. The whole package is amazing. Also if you get the two disc version, one of the discs is a live DVD. As one of the main song-writers for the band do you find it hard to have a favourite song on a new album? Can you choose or are you too close to them? I do have songs that I really like from all our albums but it can be hard because you work on them for so long that you always want them to be good. 'Built To Last', because everything clicked on that track, and 'Twilight Princess', which is a big production song, are ones I like from the new album, 'Twilight Princess'. Mainly because I wrote that one all by myself. What happens mostly now is that when we write a song and play it we all know when it's a good song. I'm sure other artists have that same feeling, you just know when you've written something good. However there are a lot of levels of good (laughs). So it's hard as a writer to have favourites but over the years I have fallen in love with a lot of our songs. You released your first lyric video, 'The Sacred Vow', before the new album's release. Have you been getting good feedback from this? We have and 99% of the feedback has been great and very positive. With today's technology people can get to hear and see things much quicker than ever, so it's a great way to gauge what the fans think of the new material. Okay, you always get that 1% who say why can't you make 'Glory To The Brave' again or why don't you sound like you used to but that's a minority. Thankfully most of our fans have loved the song. The idea for the lyric video was another Napalm idea and it's really worked well for us. The production on the album is, as you would expect, big and bombastic. An in house job? Yeah mostly. We recorded the album at my home studio, then Fredrik Nordstrom of Dream Evil, who records the drums for us, mixed the album at his place, Studiofredman. As you probably have heard before it's the mix where the magic happens and Fredrik makes us sound good. The vocals for the last three albums have been recorded in America with James Michael of Sixx: AM and working with him has meant that Joacim Cans, our singer, has been sounding better and better over the years. We also have the big advantage of having Pontus Norgren in the band who's a great producer and sound engineer himself, which helps when we're trying to get the guitar, bass and vocal levels right. Got to say I love that word you used - 'Bombastic'. Sums up the album sound perfectly (laughs). You've got a big tour coming up soon that takes in Germany, Belgium, Poland, Hungary and then you're off to the States with Delain. When can we see you again in the UK? We have things in the works for the UK. First off we'll be playing at Hammerfest which is in March of next year, then well, let's just say we have a few things planned for Great Britain but I can't go into details just yet. So keep an eye out for us and one day very soon we'll be there (laughs). 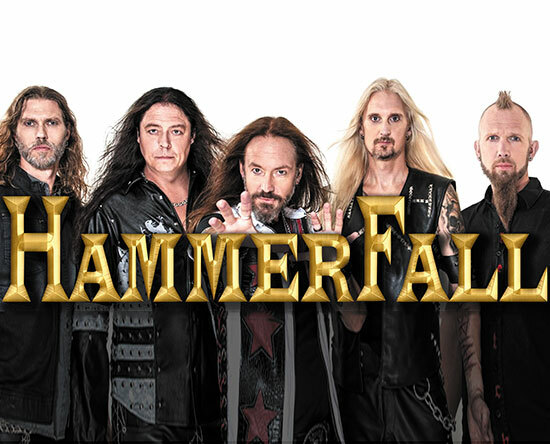 What next for HammerFall? As it's your twentieth year as recording artists have you anything special planned? Not really, no, is the honest answer. Promoting the new album is the priority for us and we want to tour it all over the world because we're very, very proud of it and want to play it to as many people as we can. We have talked about doing something special for 'Legacy of Kings' which came out in 1998 but that's just us as a band shooting ideas around the table. We actually did celebrate our twenty-fifth Anniversary as a band at Wacken Open Air in 2014 where we played the 'Glory To The Brave' album in its entirety. We did this because Wacken was the very first show we ever played outside of Sweden. So no, nothing on the cards just yet. We'll have to see what the future brings and as I said before just keep an eye out for HammerFall and we'll be there one day to surprise you.